It is January and in the Northeast, where we live, the cold has settled in and the snow is here to stay for a while. Weather like this always makes me think of cozy, hearty food and few things are as cozy and hearty as a good beef stew. I love the thought of beef stew… bits of beef and vegetables in a warm, rich sauce. It’s just the reality I have a problem with. You see, when I was a child, my mother adored making, serving, and eating Boeuf Bourguignon. We had it all the time. 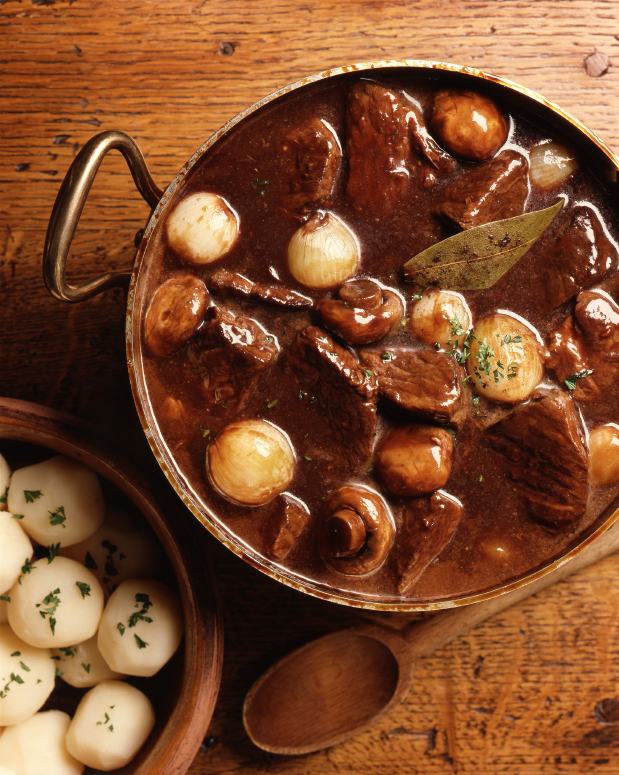 In case you’re not a Francophile, or don’t eat like one, “Boeuf Bourguignon” is a French beef stew made with wine, mushrooms and pearl onions. Adults love it. Kids, well, let’s just say that they haven’t learned to fully appreciate beef bits cooked in a bottle of red wine with a bunch of mushrooms and pearl onions thrown in. Good Boeuf Bourguignon has a very sophisticated and elegant taste- something lost on most little palates. Certainly that was true for my family. Egged on by my older brother, my siblings and I protested the meal by referring to it only as “Beef Boogies.” My mother was unyielding however. 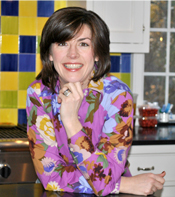 Though her four kids complained bitterly, “Beef Boogies” would return again and again to our dinner table during the winter months. Well, now I am grown up. And, I have to confess, I have not had Boeuf Bourguignon in more than thirty years. But, the huge amount of snow and the bitter cold outside has had me yearning for a good stew recipe. As I searched cookbooks and the Internet alike, Boeuf Bourguignon recipes kept coming up again and again. I thought back to my childhood and realized it was now or never: I had to wrestle this dinnertime memory, conquer it and remake it as my own. I continued my research, and mentioned to my sister that I was tackling remaking the Boeuf Bourguignon from our youth. She was aghast- but also intrigued. Could I remake “Beef Boogies” and like it? Could she make my remake and serve it to her family? She could not wait to hear! I fine tuned my search, chose my finalists, combined the best parts and made the dish. Then, I let the stew sit for 48 hours before serving. I served it last night to dear friends, with mashed potatoes and a salad, in my kitchen. We dug in. The warmth of the stew, coupled with the warmth of the evening, was a perfect foil to the cold wind that blew outside. We loved every bite and every minute of the night. I had done it- the demon was excised. “Boeuf Boogies” lives no more. Note: My daughter Julia, who is quite a foodie, tried this and declared it “not [her] thing.” Based on my childhood experience and Julia’s reaction, I believe that there is something to this dish that demands an adult palate- maybe it’s that bottle of wine! Therefore, I recommend this for an adult evening. You will not be disappointed. 1. Preheat the oven 275 degrees. 2. In a large dutch oven, sauté the pancetta over medium heat until browned and crisp- about 10 minutes. Remove the pancetta with a slotted spoon and let drain on a paper towel. 3. In a large flat bottom bowl, mix the flour, 1 T of sea salt and 1 T of pepper. Dry the beef cubes and veal shank with paper towels and dredge them in the flour mixture. 4. In batches, in a single layer, sear the beef and veal shank in pancetta oil for 3 to 5 minutes, turning to brown on all sides. Remove the seared beef to a plate and continue searing until all the beef is browned and set aside. If needed, add canola oil to the pan to sauté the beef. 5. Sauté the finely diced carrots, celery, onion and garlic in the dutch oven until soft. If needed add a bit of canola oil to the dutch oven. Add the tomato paste and sauté for another 2 minutes. Remove and set aside. 6. Add canola oil to the dutch oven and sauté the carrot chunks and onion slices for 5 minutes, or until the onions are soft. 7. Return the diced carrots, celery, onion, garlic and tomato paste mixture to the dutch oven and toss with the onions and carrots. Continue to sauté for 1-2 minutes until mixture is blended. 8. Add the cognac to the dutch oven, stand back, and ignite with a match to burn off the alcohol. 9. Put the meat and the bacon, with all their juices, back into the pot with the vegetables. Add the bottle of wine and beef stock. Add the thyme and the bay leaf. Bring to a simmer, cover the pot with a tight fitting lid and place in the oven. Bake for 1¼ hours. 10. Melt the butter in a large sauté pan and sauté the mushrooms for 10 minutes, or until browned and their liquid is reduced. 11. Add the mushrooms and the pearl onions to the dutch oven and cook for an additional 30 minutes. ****Serve 24 to 48 hours later. Store in refrigerator. To reheat, warm in a 350 oven for one hour. This entry was written by Caroline, posted on January 15, 2011 at 9:28 pm, filed under beef, comfort food, entertaining. Bookmark the permalink. Follow any comments here with the RSS feed for this post. Post a comment or leave a trackback: Trackback URL.